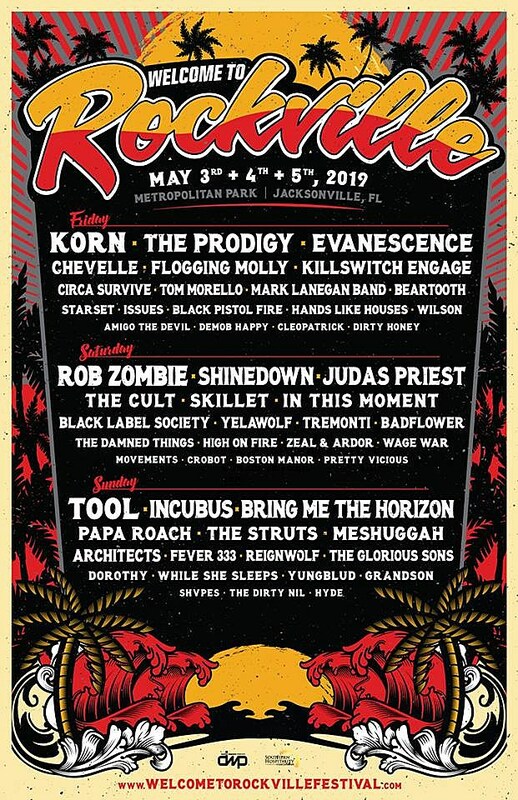 The lineup for the annual Welcome to Rockville festival has been announced, including Tool, Korn, Rob Zombie, Judas Priest, Incubus, The Prodigy, Flogging Molly, The Cult, Meshuggah, Killswitch Engage, Circa Survive, Tom Morello, Mark Lanegan Band, Yelawolf, High on Fire, Zeal & Ardor, The Dirty Nil, Architects, and more. The fest goes down May 3-5 in Jacksonville, FL, and tickets go on sale Friday (12/7) at noon. Full lineup and poster below. That was my aunt… Now she sees me going down the spiral of Kiss and Black Sabbath and she goes ‘hang on, check this out.’ I don’t know how she managed to express all this in such a short, concise period of time to a kid who was watching monster movies on Saturday. But she was actually able to convey to me here’s a person who’s a woman, who is writing her own songs, who is producing and mixing and releasing her own songs. And it’s a woman fighting this uphill struggle in arguably a man’s rock world. And it was Black Sabbath [self-titled], pretty amazing. So I just had that. I would just turn the sound down on TV and I was just listening to the album watching the monster movies. Because understanding the patience that Pink Floyd has when [they’re] not playing the note yet—wait until this thing finishes its emotional cycle before we play the next note. That discipline is so difficult for musicians because they’re looking for the payoff right away. So in this album, “Things We Lost In The Fire“, there is so much patience and restraint. Every project I’ve been in, whenever I suggested we get that slow it’s almost like panic. It’s hard for them to really dig in. Everybody wants to speed it up. This last album [it was] like ‘turn the tempo up, turn the tempo up.’ It’s like ‘I think you are missing something here. I think you are missing an opportunity to really draw someone one in, almost like hypnotism.heir approaches. If you listen to some of those early albums—most of them are, in my opinion, I am not a lawyer—a lot of those early songs seem like they are direct ripoffs of classic rock songs, just sped up and quirked out. So you listen to them, it’s like them trying to stiffen up classic rock into this weird, digital quirky… nature. I just love that. 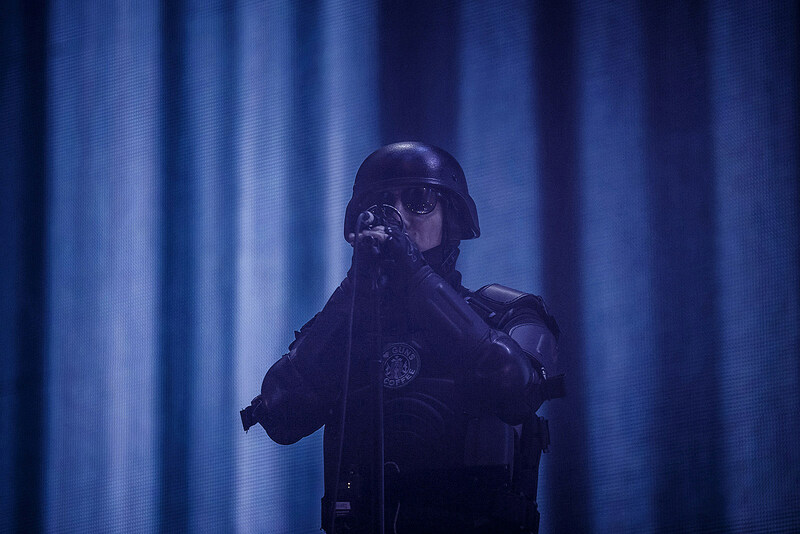 Again, it took me outside of my conventional understandings of music as it goes. And then after Black Sabbath and all those other things you’re still getting back into those kind of song structured things… Foreigner and Bob Seger and then all of a sudden Devo comes along and you go ‘Whoa what’s this?’ and then you play it for your friends and they go ‘I don’t understand you. Every project I’ve been in, whenever I suggested we get that slow it’s almost like panic. It’s hard for them to really dig in. Everybody wants to speed it up. This last album [it was] like ‘turn the tempo up, turn the tempo up.’ It’s like ‘I think you are missing something here. I think you are missing an opportunity to really draw someone one in, almost like hypnotism.